Control which users and visitors can see the Messenger. You can turn off the Intercom Messenger launcher in your Messenger settings. Just deselect the options to show the standard launcher to users and/or visitors. This disables the launcher in your app (or on your website) which allows your users to contact you, and see their past conversations with you. 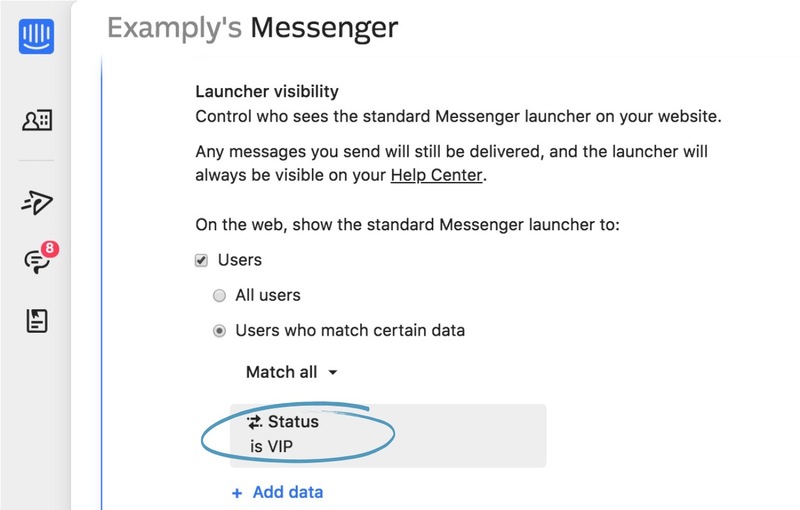 Your Messenger visibility settings will also apply to the Messenger on your Help Center. You can also disable it by removing the "config.inbox.style = :default" line from the rails gem. All your outbound in-app messages are still delivered to your users even when the Messenger launcher is disabled and will be available to view when the launcher is turned back on. You can also completely customize the launcher – here's how to do it. Note: If you've hidden the launcher on mobile and choose to send an in-app message to initially display as a badge, the message will mark as sent but the end user will never see it. 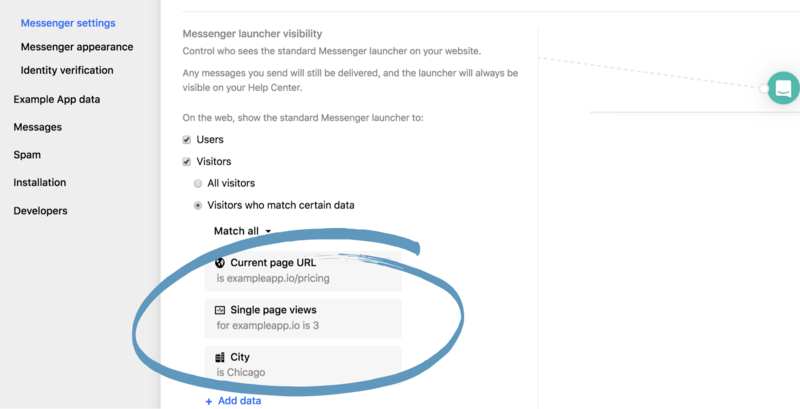 You can control which types of website visitors can see the standard Messenger launcher on your website, so your sales team can chat to more of the types of leads you want. Finally, select ‘Add data’ and choose the attribute or attributes you want to filter visitors by. For example, if you find that too many visitors are writing in and your sales team is spending too much time on low value leads, then you could only show the Messenger launcher on pages of your website where visitors have a stronger intent to buy, such as the pricing page. You can add as many attributes as you like. For example, below we’ve chosen to show the launcher to visitors on the pricing page, who have viewed it 3 times and are from Chicago. You can also control which logged-in users see the Messenger. For example, you might only want your VIP customers to see the Messenger so you can offer them real-time support. First, you’ll need to hide the Messenger for all of your customers. Just visit your Messenger settings page and deselect the options for showing the Messenger. Next, you’ll need to think about which users you’d like to show the Messenger to (for example, your VIP customers) and add some code to identify them in your app. We recommend storing this as a boolean, like UserIsVip. 3. Finally, add the hide_default_launcher attribute to your intercomSettings object on your site, and populate it with true or false using the boolean you defined in step 2. The value of hide_default_launcher should be true if you want to hide the launcher, or false if you want to show it. Note: If you followed the steps above, you could use a snippet like this to show the launcher to your VIP customers only. Remember to input your workspace ID (this appears as your app ID in the code) where specified. We created some sample code here using jQuery that demonstrates how you can apply this method. Note: Even when you hide the launcher, your messages will still appear for your customers. The difference is they won’t be able to access the Messenger when they want to. Set up a visitor auto message to proactively reach out to visitors of your website based on what they do. Learn how to customize your Messenger home by adding apps for both new visitors and current users. Start capturing your visitors’ email addresses with an auto message.